"Come out to the country"! 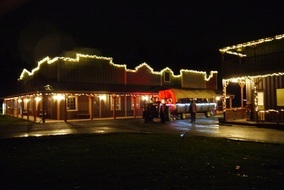 Leave the busy city behind, and enjoy the short trip to a 73 acre horse ranch in Maple Ridge that has been transformed into a Christmas wonderland. Here you will be enchanted by glorious lights, beautiful trees, interactive scenes, lovely music, and delightful activities that remind us of times when Christmas was a lot simpler . . . and a lot less commercial. It’s all priced so reasonably that you’ll want to return with your friends! Country Christmas is done for the season! Thanks to everyone who came and had a great time! Registration for 2019 will start in the fall. ​Look here for updates in case of road closures. ​​Timberline Ranch is a year-round camp and retreat centre that serves thousands of children and families annually, through summer camps, guest group rentals, special events (like Country Christmas), and seasonal retreats. Check out our website ​for much more information and all of our programs.